The M18 90-mm Gun Motor Carriage (or the M18 Super Hellcat) is a premium Rank IV American tank destroyer with the battle rating of 6.3. It was introduced in Update 1.51 "Cold Steel". It is similar to the Rank III M18 Hellcat, only using the M36 GMC turret to mount the 90 mm gun with a minimal decrease in top speed. Ammo racks of the Super Hellcat. The M18 "Super Hellcat" should be very familiar to those who play the M18 Hellcat. It is very fast, equipped with a hard-hitting cannon, but at a cost of armour. Thus, the M18 Super Hellcat is a mobile hit-and-run vehicle, popping out from behind a cover and blasting the enemy with a shot before retreating. Change up the firing location often to avoid being hit if someone has located the Super Hellcat's position. The Hellcat won't hold the line by standing and absorbing shots, but it can if it is picking off each attacker one by one like a sniper. The main focus of gaining the Super Hellcat is the 90 mm upgrade; and it is absolutely beautiful. The main round recommended to use well be the M82 APCBC round, the reason being reliable one shot knock-outs. The M82 has enough penetration to penetrate a Tiger I through the front plate. In an offensive and defensive position, the Hellcat should still remain behind cover and be constantly changing firing positions. Once a shot was fired, retreat back to cover and wait out until the next round is reloaded. In an offense, pop out from the cover occasionally and snipe at the enemy. In a defense, remain behind cover and catch the enemy off guard as they approach by letting them shoot a different target first and hit them while they are reloading. Another way is to let them move right into the Hellcat's line of sight, which should at best expose their sides, allowing for a shot to land a M82 APCBC round into them. A more aggressive play style is as a flanker and a point-capturer. The Hellcat's great speed can allow it to get around an enemy concentration and shoot them on the sides while they are focused at allies in front of them. They may eventually catch on to Hellcat's presence, and the Hellcat should take a more conservative action by returning back to the shoot-and-scoot tactic behind cover. The Hellcat's speed can also be used to rush towards the point. 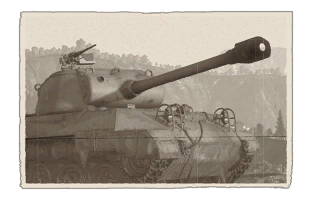 Though not recommended due to exposing the Hellcat's to enemy fire, the speed can ensure the Hellcat will be the first on the point, with a 90mm gun to defend itself. If lucky, the enemy team is too slow and the Hellcat will capture the point. If unlucky, the enemy will swarm the point, outnumber and constrict the Hellcat and destroy it. Thus it is not recommended to play as a point-capturer. With good shots, the cheeks of a Tiger II (P) can be hit. 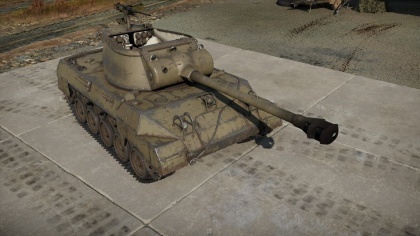 Penetrating the Panther series (up to the Panther II) will require a clean shot to the mantlet and for the Panther II, a hit the flat of the turret. Same principles apply on Soviet mediums like the T-44, hit the cheeks and turret ring. For Soviet heavy tanks, hit the lower glacis or the turret cheeks. Using the standard AP shot as a primary round isn't recommended as the fragmentation is minimal, same goes for APCR, which should be used only on the toughest enemies. Despite that, AP is useful against some enemies like the Tiger II (H) as the regular APCBC can penetrate the flat sides of the turret front. Use AP if there is a clean shot on the flat part of Tiger II (H) turret as it cant be penned by APCBC but if the turret is angled even a little AP well bounce so then use APCR same on Russian heavy tanks. Little hint when using AP or APCR on German/ Russian heavy tanks aim for the right side to hit the gunner and commander, giving precious seconds to escape. AP and APCR isn't recommended to shoot the angled front plates of the German Panther and Tiger II's as the angle is steep enough to absorb the shot unless at point-blank range. The reload with a max reloading skill is 9.5 seconds which gives it a decent rate of fire. Fantastic 90 mm gun with a very lethal M82 APCBC round. Pintle .50 cal machine gun is effective for anti-air purposes. Fast Hellcat speed, forward and backward. Exposed crew, watch out for machine gun and artillery. A penetrating round, even if inflicting minimum crew damages, have high chance of disabling the transmission or engine. Ammunition always stored in hull sides. During World War II, the M18 "Hellcat" tank destroyer was very effective in its role in American service. Despite that, an attempt to upgrade the vehicle with a better gun took effect around 1944. Instead of the 76 mm gun that it originally had, it would take the 90 mm gun that was going into service at the time. Despite the drawbacks, it was deemed an acceptable vehicle to use in the battlefield. The 90 mm gun would provide a very large firepower advantage over the 76 mm gun the M18 had originally, which could not penetrate the front of the Panther tank unless in close range with HVAP ammo. The 90 mm could take out most of the late war German tank designs with ease. However, the war ended before the "Super" Hellcat could be deployed for combat use, and the project was cancelled along with the disbanding of the tank destroyer doctrine. This page was last edited on 26 March 2019, at 06:46.